This sample can apply to a marriage between siblings, first cousins, second cousins and the like. You simply create your genealogy tree as usual, then you select both the husband and wife and click on the Family Wizard button. 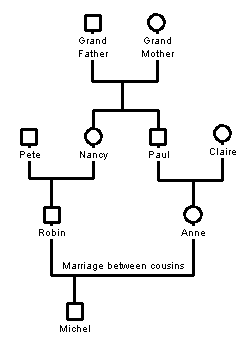 In this example, you would select Robin and Anne and hit the F key to invoke the Family Wizard . If you already have a family created, you simply select Robin and use the "Link As Parent" to link Robin as the parent of Michel. You repeat the process to link Anne as the parent of Michel. Hold the Shift key to select non-adjacent objects. Do not use the AutoArrange after creating a marriage between cousins. The AutoArrange does not recognize such a layout.